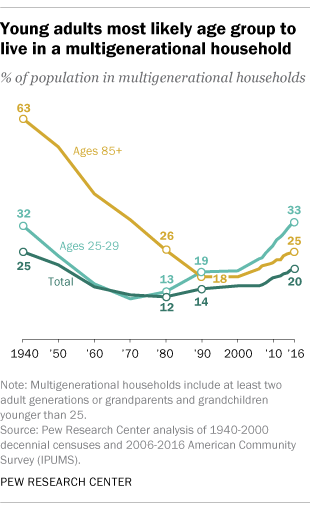 The number and share of Americans living in multigenerational family households have continued to rise, despite improvements in the U.S. economy since the Great Recession. In 2016, a record 64 million people, or 20% of the U.S. population, lived with multiple generations under one roof, according to a new Pew Research Center analysis of census data. 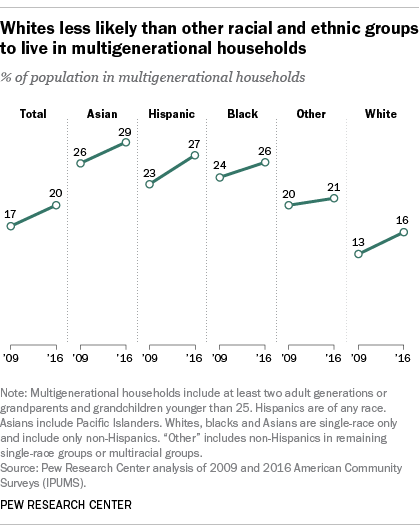 Multigenerational family living is growing among nearly all U.S. racial groups, Hispanics, most age groups and both men and women. 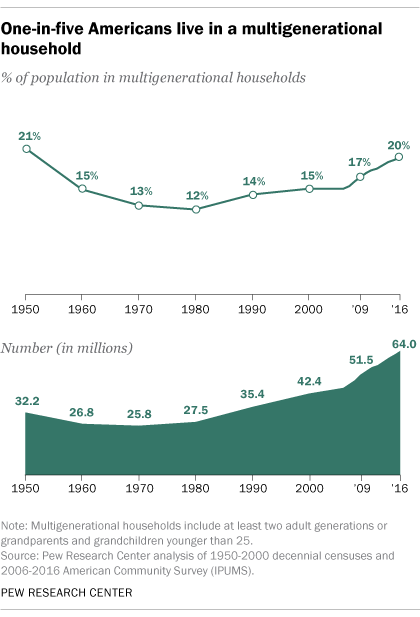 The share of the population living in this type of household – defined as including two or more adult generations, or including grandparents and grandchildren younger than 25 – declined from 21% in 1950 to a low of 12% in 1980. Since then, multigenerational living has rebounded. The number and share of Americans living in these households increased sharply during and immediately after the Great Recession of 2007-2009. Since then, growth has slowed a little but has remained much more rapid than the growth before the recession. 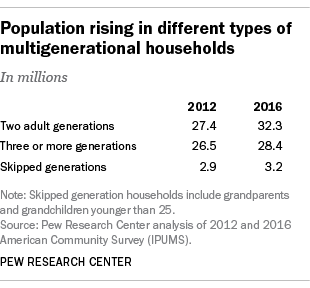 In 2009, 51.5 million Americans (17% of the population) lived in multigenerational households, according to data from the U.S. Census Bureau’s American Community Survey. In 2014, 60.6 million Americans – 19% of the U.S. population – were part of multigenerational homes, according to the last major Pew Research Center analysis of this data. Growing racial and ethnic diversity in the U.S. population helps explain some of the rise in multigenerational living. The Asian and Hispanic populations overall are growing more rapidly than the white population, and those groups are more likely than whites to live in multigenerational family households. Another growth factor is that foreign-born Americans are more likely than those born in the U.S. to live with multiple generations of family; Asians and Hispanics are more likely than whites to be immigrants. Among Asians living in the U.S., 29% lived in multigenerational family households in 2016, according to census data. Among Hispanics and blacks, the shares in 2016 were 27% and 26%, respectively. Among whites, 16% lived with multiple generations of family members. In recent years, young adults have been the age group most likely to live in multigenerational households (previously, it had been adults ages 85 and older). Among 25- to 29-year-olds in 2016, 33% were residents of such households. Among a broader group of young adults, those ages 18 to 34, living with parents surpassed other living arrangements in 2014 for the first time in more than 130 years. Education levels make a difference, though: Young adults without a college degree now are more likely to live with parents than to be married or cohabiting in their own homes, but those with a college degree are more likely to be living with a spouse or partner in their own homes. But even among some other age groups, at least a fifth live with multiple generations under one roof, including Americans ages 55 to 64 (24% in 2016) and 65 and older (21%). The rise in multigenerational living among these older Americans is one reason why fewer now live alone than did in 1990. Among all Americans, women (21% in 2016) are more likely than men (19%) to live with multiple generations under one roof. This pattern has been true for decades, but it is not the case for all age groups. For adults ages 25 to 44, men are more likely than women to live in multigenerational homes (23% vs. 20%, respectively). For example, among 25- to 29-year-olds in 2016, 35% of men and 30% of women lived in multigenerational households. Among 30- to 34-year-olds, 22% of men and 19% of women did so. The most common type of multigenerational household – home to 32.3 million Americans in 2016 – consists of two adult generations, such as parents and their adult children. We define adult children as being ages 25 and older, so our multigenerational households do not include most college students who live at home. Households with three or more generations – for example, a grandparent, an adult child and a grandchild of any age – housed 28.4 million people in 2016. (Fewer than a million people lived in households with more than three generations in 2016.) Another 3.2 million Americans lived in households consisting of grandparents and grandchildren. We made a minor change in our methodology for this analysis that did not affect our total number of multigenerational households, but did reclassify a relatively small number of them into a different category. For example, some households consisting of a grandparent and a grandchild older than 25 are now classified as “two adult generation” households. Previously, they had been classified as “skipped generation” households. This change affects some previously published numbers. A small share of these “two adult generation” households includes minors who may be great-grandchildren. Such households thus may actually consist of three of more generations, but we cannot say so definitively because of limitations in the census data we used. The Census Bureau uses a narrower definition of multigenerational households than we do. The major difference is that the bureau says multigenerational households must include at least three generations, where we require only two adult generations. For more details about our methodology, see this explanation. Note: This is an update of a post originally published Aug. 11, 2016.